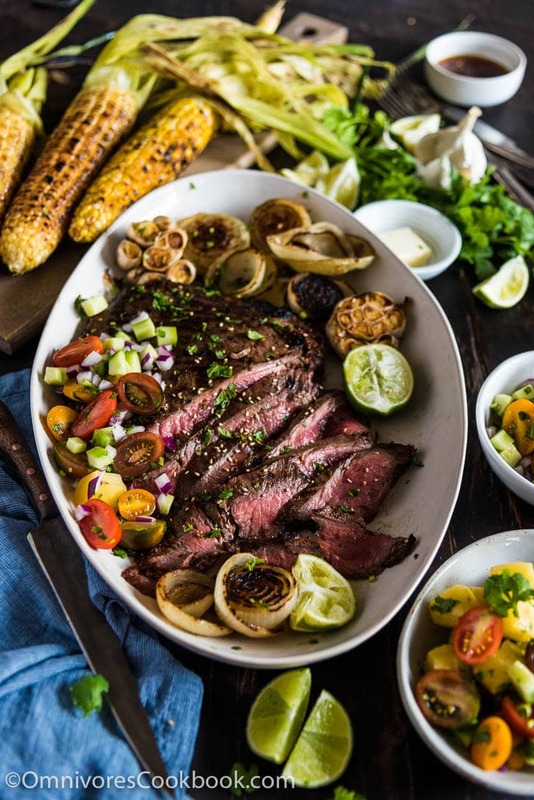 This recipe shares the secrets to creating the tenderest marinated flank steak that is bursting with flavor; included are salad and side dish ideas for an inexpensive dinner party. Mie Cafe is a modern Cambodian-French restaurant located north of Siem Reap. During my last visit, head chef Pola gave a steak demonstration that totally blew my mind. The steak had the tenderest texture, yet he used a very lean cut. The dish also had a fruity aroma and was bursting with flavor. The secret lay in the marinade. 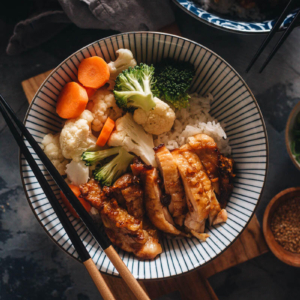 Chef Pola used a mixture of pineapple juice, rice vinegar, lime juice, ginger, and a few other herbs to create the most delicate marinade, one that helped tenderize the meat while adding tons of flavor. This recipe was inspired by the steak I had at Mie Cafe. I do not have the original recipe, but I used a similar combination of herbs and seasonings that I learned from chef Pola. Just as I expected, the flank steak turned out fragrant, juicy, and tender. The amazing thing was that when I heated up the leftovers and cooked the steak to medium, it remained tender. 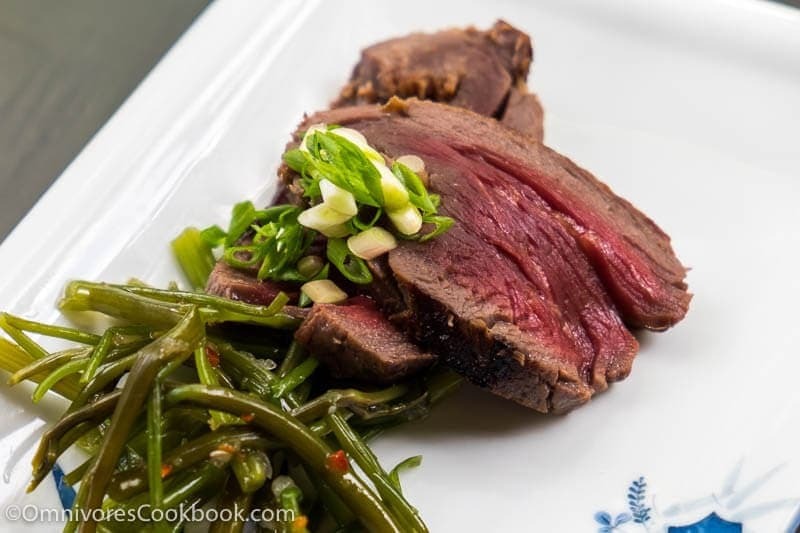 The salt from the soy sauce, acid from the lime juice, and the enzymes from the pineapple and ginger worked together to tenderize the tough flank steak. The only thing you need to be careful about is not to marinate the steak for more than 4 hours. Otherwise the enzymes will break down too much muscle fiber and collagen and turn the meat mushy. Not only do these ingredients make the cut tender, but they also impart an extremely fruity aroma that works perfectly with the smokiness provided by the charcoal. The spices will work their way into the steak if you let it sit in the fridge overnight (after it’s been cooked) before serving. Thus, the dish works extremely well when prepared ahead of time. 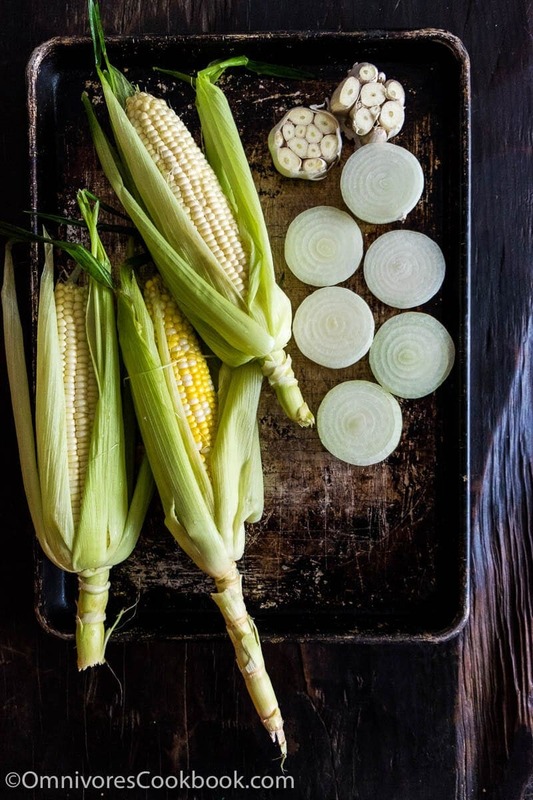 To make the prep fast and easy, use a sharp lemon zester to grate the lime, ginger, and garlic. It took me just five minutes to get the marinade ready. 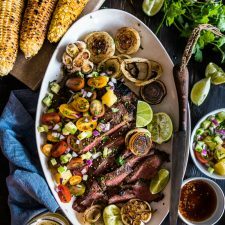 Make sure you reserve some of the marinade before mixing it with the steak, because you can use it as a salad dressing and/or dipping sauce for the steak. We got these flank steaks at Costco for $5 per pound. For a party of six, get two cuts that weigh 1.5 pounds each. Then you’ve got the perfect main dish for just $15. Even if you’re serving a smaller crowd, you can still cook two cuts and save the leftovers for later. I included a simple pineapple salad, which uses the pineapple left from the can (the can from which you get the juice for the marinade). The salad makes a refreshing appetizer and goes well with the steak. 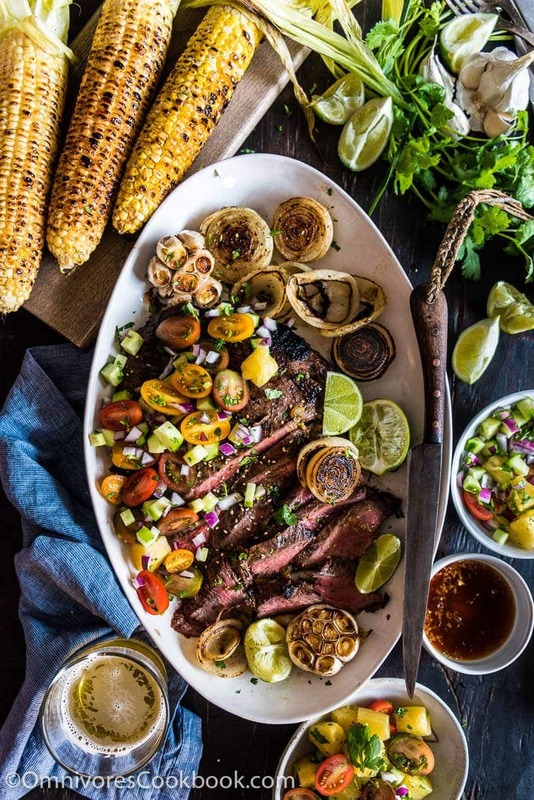 For sides, I love to serve this steak with grilled corn on the cob, especially in summer. You can also serve grilled asparagus, onion, or potatoes. If you’re planning an Asian-style party, rice noodles and steamed rice work well, too. No matter which of these sides you choose, the entire meal will cost 5 to 6 dollars per person. To prepare and cook for the party, I highly recommend cooking the steak a day ahead. Just as I mentioned above, it tastes even better and is even tenderer after sitting overnight in the fridge. I also included a method for cooking the steak on the stovetop, in case you don’t want to pull out your grill. To heat up the steak, simply wrap it in aluminum foil and bake it at 93 degrees C (200 F) until warmed up. If you plan to make any grilled sides, you can cook them ahead of time, too, and heat them up with the steak. Prepare the salad a few hours before serving, and store it in the fridge. Mix it with salad dressing right before serving. You see? 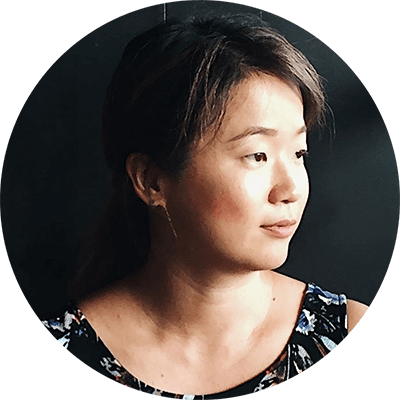 You can host a fun Asian-style party at a low cost. The food will be fancy and appealing, and the preparation and cooking are stress free! 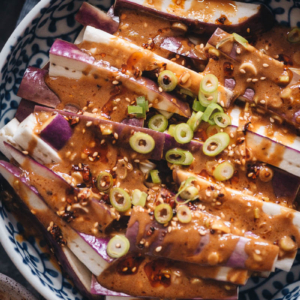 Combine every ingredient for the marinade in a bowl and whisk to mix well. 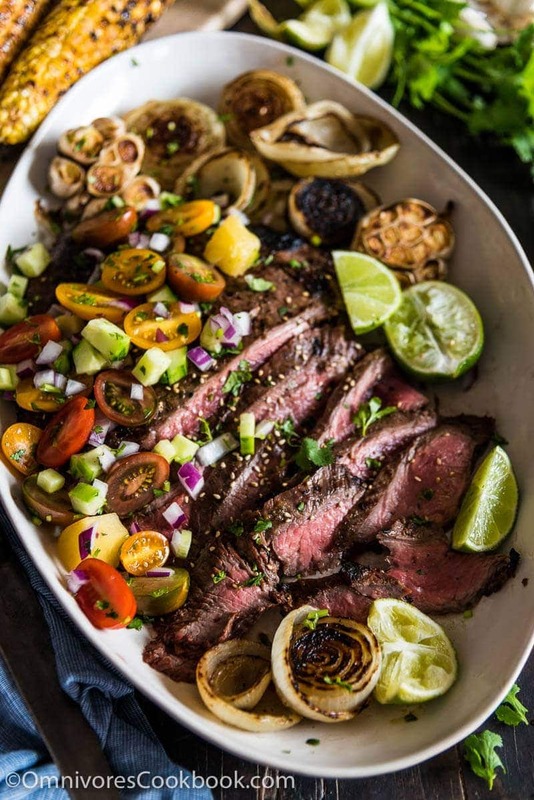 Chop vegetables and mix the salad in a bowl while marinating the steak. Cover with plastic wrap and place in the fridge. When the steak is ready to cook, remove the steak from marinade and pat dry with a paper towel. Discard the marinade. Brush the steak with a thin layer of oil. Lightly season both sides with sea salt. Build a modified two zone fire and let the grill heat up. 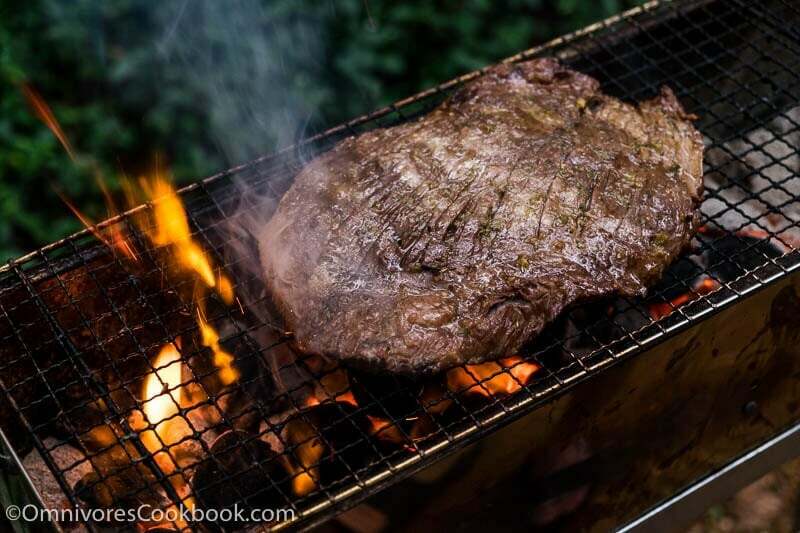 Cook the steak on direct fire until the surface turns dark brown, about 3 to 4 minutes per side. Flip 2 to 3 times during grilling. Move the steak to the indirect zone and lift one side with a pair of tongs. Check doneness by inserting a thermometer into the thickest part of the steak: 51 degrees C (125F) for rare, 54 C (130 F) for medium rare or 57 C (135 F) for medium. Cook the steak more over direct heat if needed. 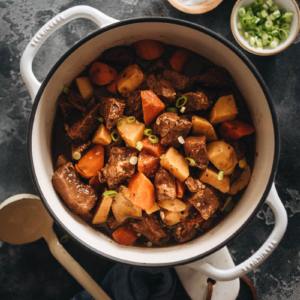 Heat a large cast iron pan or a heavy duty pan on high heat until hot. Place steak in the pan and sear for 2 to 3 minutes without moving, until the bottom side is browned. Check by lifting up a side of the steak to see if nicely browned. If so, flip the steak and sear the other side for 2 to 3 minutes. If you’re using a cast iron pan, remove the pan from the heat and let the steak continue to cook for 5 to 10 minutes on the residual heat. If you’re using other types of pan, place the pan over low heat and cook until it reaches the desired doneness. Transfer the steak to a large plate and cover loosely with aluminium foil. Let sit 5 to 10 minutes before serving. If you will serve the steak later, let it cool down a bit, wrap it with aluminum foil, and store it in the fridge. Gently heat up the steak in the oven at 93 degrees C (200 F) until warm. If you have leftovers, you can bring the steak to room temperature and use it in a sandwich or on a salad. It will be just as tasty. The enzymes in the pineapple tenderize the steak but the meat will turn mushy if marinated for too long. 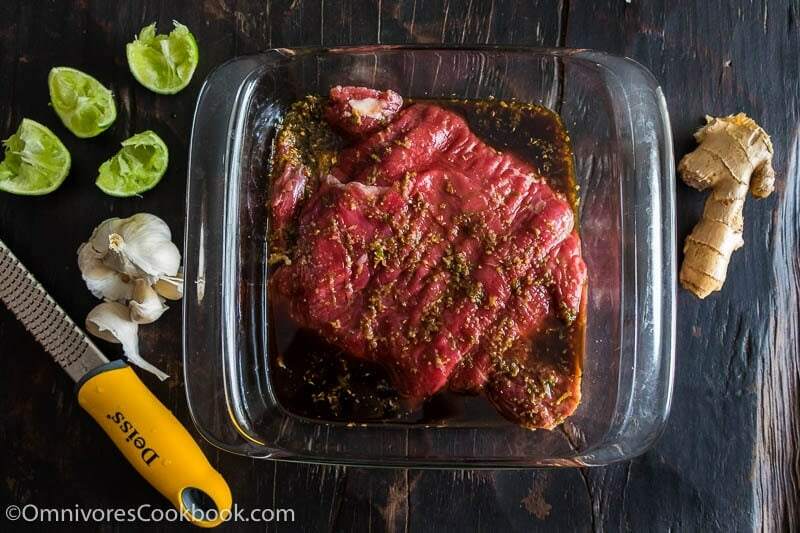 Transfer the steak to a ziplock bag and discard the marinade if you are not planning to cook immediately. Oh wow Maggie – the meat looks perfectly cooked and all the side sound wonderful. The colors in this dish are picture perfect! I love that you can make this ahead and have it ready in no time for company. Thanks! Have a lovely weekend. Thanks Tricia! I love the color in this dish too. The steak is such easy to prepare and we had been enjoying very good steak salad in the past few days 🙂 You too, have a great weekend! I had to come back and look at your photos again today because I’m pretty sure they were in my dreams last night! These foods and flavours are spectacular, Maggie, and I really need to eat BBQ with you!! Now we have two things on the list, sailing and eating BBQ together! This looks insanely edible and I love the pineapple here. Grilling is always happening here in San Diego and I am loving this Maggie. Happy to see you point out the max time on marinading, those enzymes in the pineapple are tricky. I tried 4 times to make a pineapple gelatin and wasted time and money until I looked it up and the enzymes will not work with gelatin. I thought I was going mad. Ended up doing a mango instead. Great photos, too! Looks like a good recipe but I just want to point out one thing. Bromelain (the enzyme in pineapple that tenderizes meat) is destroyed by heat so if you use canned pineapple or any other pasturized pineapple juice, etc it will not actually tenderize the meat. You just need to use some fresh pineapple and juice it yourself (frozen is ok too).